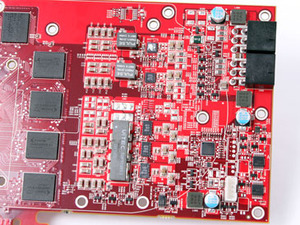 Moving to the back of the card, the PCI bracket is kitted out in exactly the same way as the Radeon HD 4850’s, meaning there are two dual-link DVI connectors (complete with four HDCP cryptos) and an HDTV-out port sitting between the two digital connections. 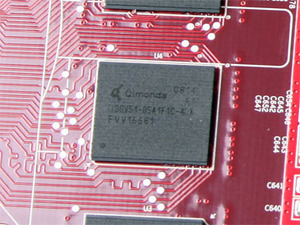 The chip also natively supports HDMI and DisplayPort, giving board vendors the opportunity to customise their designs, and like the Radeon HD 2000 and 3000 series cards, there is support for audio. This time around though, AMD has beefed up the RV770 audio controller’s capabilities and it can now support 7.1 high definition sound with bitrates of up to 6.144Mb/sec at 192KHz using all of the popular audio formats either via native HDMI or a DVI-to-HDMI dongle (supplied). 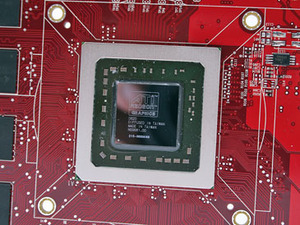 CrossFire support is also present, and the implementation is exactly the same as it is on the Radeon HD 4850 – one connector for dual-card configurations and then with three or four card setups, you need to daisy chain the connectors. 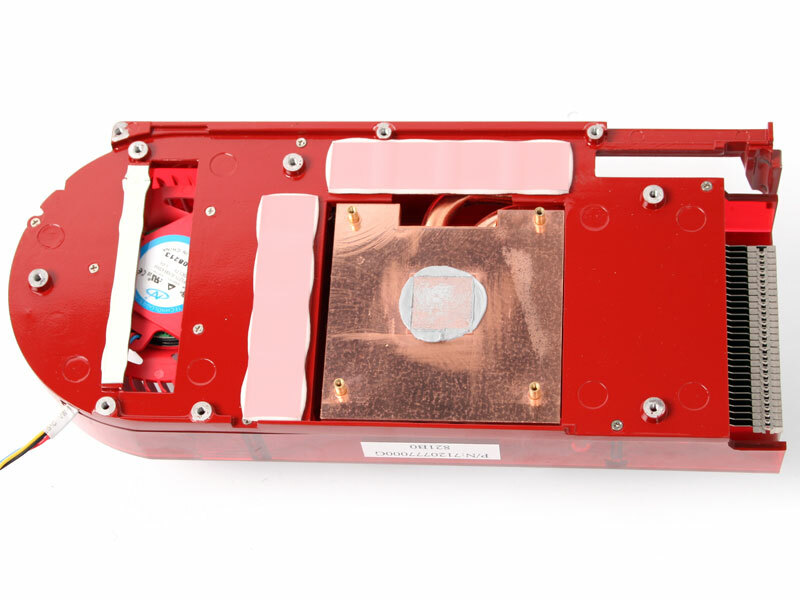 Pulling the heatsink off the Radeon HD 4870 is a simple task for the seasoned system builder and once you’ve got rid of the heatsink, the new PCB design comes to light. 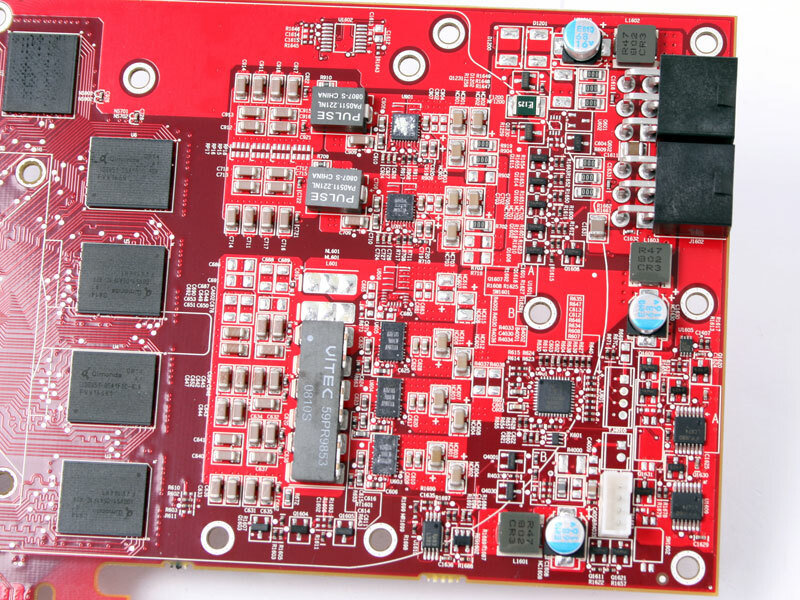 The power circuitry on the card is appreciably beefed up too – the difference between this and the Radeon HD 4850’s power deliver system is quite stark by contrast. Voltage regulation is handled by the Vitec 59PR9853 multi-phase inductor and two Pulse PA0511 VRMs – none of these chips are cooled by the heatsink, but interestingly there are a couple of unused solder points next to the Vitec inductor, meaning there’s room for a larger module should one of AMD’s partners want to introduce a Radeon HD 4870 with significantly higher clock speeds for example. The Vitec inductor, and the three MOSFETs that accompany it, appears to be responsible for regulating voltage to the RV770 die, while the two Pulse VRMs (and two remaining MOSFETs) are responsible for controlling the GDDR5 memory voltage. The MOSFETs require cooling and are covered with thermal pads that come into contact with the card’s cooling solution. Without the additional cooling, the ‘FETs are likely to pop because of the high temperatures at which they operate. 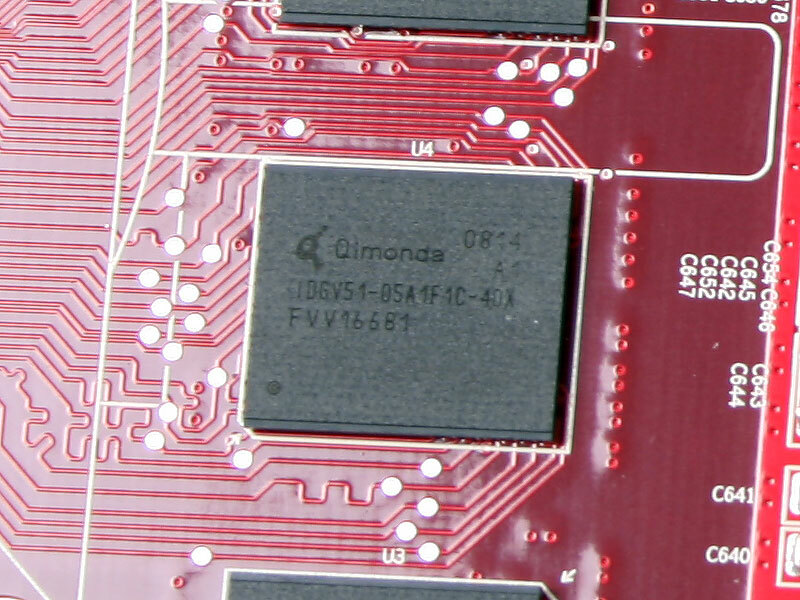 While we’re mentioning GDDR5 again, you can see the eight 64MB Qimonda GDDR5 DRAMs surrounding the die in an L-shaped format. And with that out of the way, it’s about time we dived down inside the silicon and had a look at what makes RV770 tick like a well-engineered Swiss timepiece. Looking for a DirectX11 GPU but don't want to drop £300 on an HD 5870? Then meet the HD 5850, the new GPU from ATI looking to dominate the popular £200 price point. We strap it into the bit-tech test system and find out how it measures up with the competition. The first salvos of the this years graphics card showdown have been fired, but where does your graphics card stand? We've retested every major card from the last eighteen months and beyond to help you decide if now is the time to upgrade. 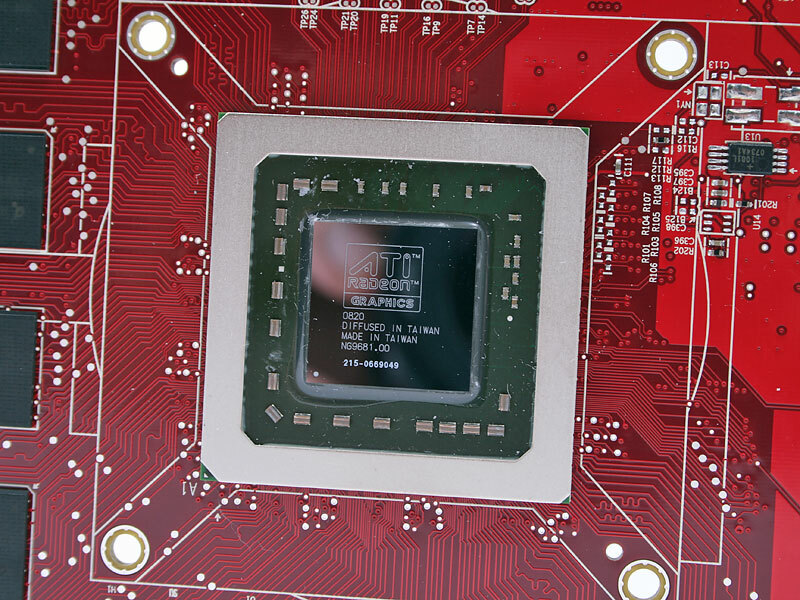 Cypress, the GPU behind the Radeon HD 5870, is the world's first DirectX 11 compliant graphics processor and it's also the world's fastest single GPU graphics card. We go in depth to examine the architecture behind Cypress and draw comparisons to generations passed.